Celebrate Disney’s “Cinderella,” a modern classic that shines with beauty, imagination…and magic! Despite being mistreated by her stepmother (Cate Blanchett) and stepsisters, a spirited Ella (Lily James) resolves to take charge of her fate. Add a royal ball, a Fairy Godmother (Helena Bonham-Carter) and a glass slipper, and suddenly – magic becomes reality! 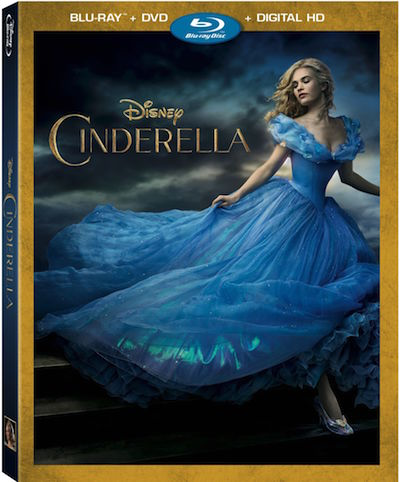 Purchase Cinderella 2-Disc Blu-ray + DVD + Digital HD on Amazon for $22.99 & FREE Shipping on orders over $35. Everyone knows the classic story of Cinderella, so it is always neat to see how the story is told from someone different. The same studio that brought us the classic cartoon version, has now brought a live action version that is just as amazing and now one of my all time favorite Disney movies! This version of Cinderella is version, that has never been told before. You learn about Ella's family, her mother, her doting father and how she came to live with her step-mother and step-sisters. You even get a little back story on the step-mother, at times you feel bad for her, but when her wickedness comes out, your remember why you don't like her! A chance meeting with the prince forever changes Ella's life. The prince can not stop thinking about the maiden he met, while Ella desperately wants to the attend the royal ball. With the help of her fairy godmother, Ella's meeting with the Prince at the ball, will forever change her life and those around her! Disclosure of Material Connection: I received the above mention for free in the hope that I would mention it on my blog. Regardless, I only recommend products or services I use personally and believe will be good for my readers. I am disclosing this in accordance with the Federal Trade Commission’s 16 CFR, Part 255: “Guides Concerning the Use of Endorsements and Testimonials in Advertising.